From the writer behind the Saw and Insidious franchises, 2018’s Upgrade goes for more of a science-fiction orientation. Set in an unspecified near future, Grey Trace (Logan Marshall-Green) resists the temptations of modern technology, as he prefers more “old school” devices. After a vicious assault leaves Grey paralyzed and his wife Asha (Melanie Vallejo) dead, he finds his possible salvation via innovations. He receives an implant called STEM that not only erases his paralysis but also enhances his physical and mental abilities, albeit with unforeseen ramifications. As noted, Leigh Whannell made his bones as a screenwriter, but he veered toward directing with 2015’s Insidious Chapter 3. I wasn’t wild about the first two films in that series, but the third worked pretty well and left me optimistic Whannell could work some magic with Upgrade. While I can’t claim Whannell makes a great film with Upgrade, he does create a fairly effective sci-fi effort. The movie mixes intrigue, technology and violence to become a reasonably involving flick. Whannell does wear influences on his sleeve, as one can easily detect inspirations here. We get obvious dollops of 2001, Robocop, The Matrix and Blade Runner, just to name a few. Despite these obvious forebears, Upgrade manages to feel like its own movie most of the time. The influences come across as semi-tangential elements but not material that gives the film a copycat impression. Given Whannell’s horror roots, I would’ve expected something more heavy-handed than Upgrade, so its fairly subdued vibe comes as a pleasant surprise. Granted, I can’t call this a terribly cerebral effort, and it could delve into societal ramifications of technology better than it does. 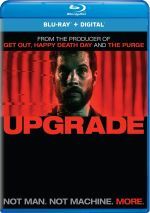 Still, Upgrade avoids any kind of heavy-handed sensibility as well, and it eschews the kind of cheap thrills that we get from most modern horror. Whannell allows the tale to play out in a gradual manner and he doesn’t give in to temptations to follow cheap clichés. On its own, I can’t claim Upgrade creates a great science-fiction thriller, but it brings us a pretty good one. It seems above average and just creative enough to succeed. Upgrade appears in an aspect ratio of approximately 2.39:1 on this Blu-ray Disc. The image worked well. Sharpness appeared strong. Virtually no softness appeared, so the movie remained tight and concise. I saw no signs of shimmering or jaggies, and print flaws remained absent. In terms of palette, Upgrade tended toward standard teal and orange, though some scenes boasted a broader sense of color. These hues showed good representation within stylistic constraints. Blacks were dark and tight, and shadows seemed smooth. The movie consistently looked solid. 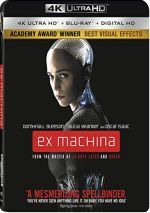 Expect a satisfying affair from the movie’s DTS-HD MA 5.1 soundtrack, as this became an engulfing mix. The track came with instances of dynamic information, mainly during action-oriented sequences. Those popped to life in an exciting fashion. Much of the flick went with more ambient audio, and those segments succeeded as well. These contributed a good sense of atmosphere and formed an involving sensibility throughout the film, factors that made this a pleasing mix. Audio quality seemed solid. Music was bold and full, and effects followed suit, as those elements appeared accurate and dynamic, with deep, tight bass. Speech remained natural and without edginess or concerns. Though not action-packed, this became a reasonably broad, involving track. The disc includes zero extras – not even previews! No one will mistake Upgrade for a science-fiction classic, but it works much better than most modern efforts. It takes a number of potential clichés and spins them into a largely compelling tale. The Blu-ray boasts excellent visuals along with good audio but it lacks any bonus materials. Despite the absence of supplements, the movie deserves a look.